We were green before it was cool. When we began this project in the late-1980’s, suburbs and strip malls and four-lane highways were spreading across what had been pristine Alabama wilderness and showing no sign of slowing down. How could we preserve that land for the future? Get people back into cities. We started redeveloping Pepper Place in 1988 to spur new growth in a Birmingham that hadn’t seen a lot of love for several decades. We started with a few blocks of abandoned warehouses and turned them into over 350,000 square feet of retail, office and workshop space, and a renowned farmers market. The railroad is Birmingham’s river. From our earliest days, the tracks that bisect our city provided a connectivity necessary for vibrancy and growth. Today, the historic east-west axis of Birmingham is again driving prosperity. The city, bounded on the west by Regions Field and the award-winning Railroad Park and on the east by the National Historic Landmark, Sloss Furnaces and Pepper Place, is alive. But, it was not until the Birmingham Rotary Club made the investment to turn old, unused, sunken railroad tracks into a walkable, urban park, did the historic connection become complete again. 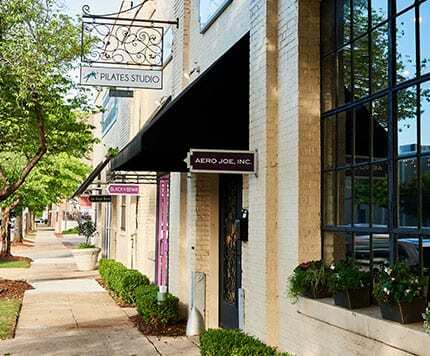 The focal point of Birmingham’s Lakeview Design District, Pepper Place is among Birmingham’s 24 commercial revitalization districts that are subject to design review protection. This highly visible renovation project has been celebrated in numerous newspaper and magazine articles and a CNN television feature. Becoming part of Pepper Place means you’re becoming a part of someplace special. We are always seeking businesses, shops, and retail to help continue building our creative community. Pepper Place is made up of more than 350,000 square feet of former warehouses and manufacturing facilities converted for modern business. Learn more about locating at Pepper Place and some of our future plans.